The latest internet sensation, Alex from Target, shot to fame this week after his picture was retweeted all over Twitter unbeknownst to him. Within 24 hours the boy was known almost everywhere but it may not all be as innocent as we all presumed as a startup company called Breakr is taking credit for the whole thing and have labelled it a marketing experiment. 16 year old Alex Lee, a store clerk at his local Target in Texas, had a picture of him in his Target uniform packing bags taken by a female customer. The customer, known as Rims, then posted the image to Twitter under her handle @auscalum accompanied by "YOOOOOOOOOO". 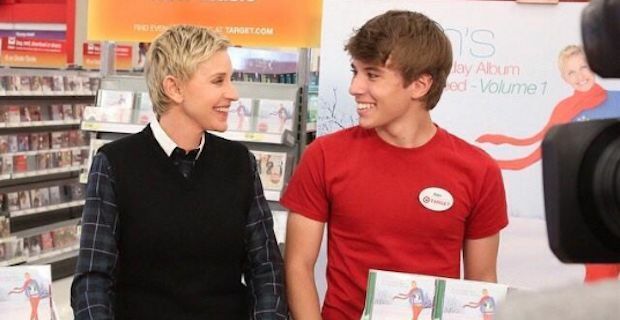 The twitterverse quickly jumped on board in unison and started poking fun at Rims man-crush by under the hashtag #AlexFromTarget. Rims has since gone on to state that the picture was not hers originally and that she got it from someone else and just posted it because she thought it was funny. Regardless of the origin, the image of Alex earned him over 650,000 new Twitter followers almost overnight and he was flown to California to appear on the Ellen DeGeneres show. But it appears that the Cinderella story of an unaware boy becoming famous out of the blue was too good to be true after LA company Breakr claimed that it was all an experiment as part of their marketing strategy. The company is an "Entertainment Network" that claims to be looking to put fans in touch with their fandom. Breakr's CEO Dil-Domine Jacobe Leonares wrote a post on his LinkedIn account with the title "#AlexFromTarget: The Power of Fangirls". In the post, he went on to explain "We wanted to see how powerful the fangirl demographic was by taking a unknown good-looking kid and Target employee from Texas to overnight viral internet sensation". He claimed that the original tweet was made by a London girl and that Breakr quickly followed it up with a Youtube video parody accompanied by #AlexfromTarget. Alex himself denies ever having heard of the company and tweeted "I didn't know the pic was taken or tweeted until my store manager showed me." Rims also came back to the confused public with the tweet "I dont work for breakr wtf i dont even know what it is". So it now looks impossible to tell what really happened here. Either this was a marketing hoax set up by Breakr originally or else they jumped on the bandwagon in order to harness the huge publicity being generated which in itself is another marketing hoax.